A member of the public poses with RPC-141, following its partial burial in a landslide during an active event. Containment Protocols: Due to the immovable nature of RPC-141, an Authority shell company has purchased the land immediately surrounding RPC-141 and constructed OL-Site-42, disguised as a museum focused on the history of Rapa Nui’s1 native people. Cultural artifacts within the shell museum are to be strategically placed around RPC-141 to herd the entity in a less destructive direction should it enter an active state. Motion sensors are installed surrounding the origin point of RPC-141, set to trigger an alarm with all assigned staff should the entity enter an active state and signal initiation of procedure Pascua-02. All staff assigned to OL-Site-42 are to be trained in the application of large-scale amnestic glyphs, regardless of security clearance, due to the inherently public nature of the entity's actions. To this end, Authority infrastructure has been installed across the island, ensuring rapid dispersion of amnestics through media channels throughout the duration of procedure Pascua-02. All Authority staff placed on Rapa Nui in any official capacity should be genetically tested and ensured to be of Rapa Nui2 descent. Description: RPC-141 is a 30m tall statue with proportions anatomically accurate to that of a physically active young man. 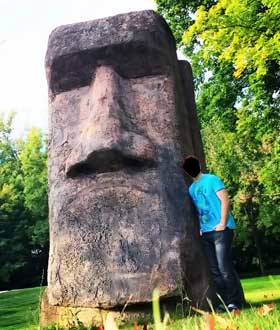 The exception to this is its head, which resembles those of the traditional Moai statues constructed by the native Rapa Nui people. RPC-141 is constructed from a material resembling volcanic basalt, which will slowly regenerate after receiving any physical damage, recovering significantly faster from damage sustained directly from human activity. There are currently no observable limits to RPC-141's regenerative capabilities and complete regeneration from non-visible fragments was observed during initial containment attempts. When any threat3 is posed to the geographical Island of Rapa Nui or the Rapa Nui people and their heritage, RPC-141 will enter an active state.4 Once in an active state, RPC-141 will attempt to destroy, disarm or stop any entity or phenomenon responsible for the activation event, exhibiting significantly more strength and speed than that which would be physically possible for an entity with the physical makeup of RPC-141. Previous triggers for activation events have included, but not been limited to; tropical storms,5 attempts at enforcing Chilean rule upon the island, Authority apprehension of PoI on the island, and [DATA EXPUNGED]. Once the source of the activation event is nullified, RPC-141 will return to its point of origin and enter a kneeling position before ceasing movement completely. This is considered the dormant state. While in the dormant state, the entity cannot be moved by any known means, anomalous or otherwise. History: RPC-141 was initially discovered by the Auctoritas6 in 1825, following a report from the British ship HMS Blossom of a large stone man protecting the native people from the aggressive actions of British sailors. The claims were not able to be confirmed at the time due to internal conflicts severely hampering Auctoritas activities. It was not until several decades later, in 1860, that the Auctoritas was able to send a containment team to the island and assess the claims. At this time, RPC-141 stood only 4m tall and, following significant negotiation with the Island’s ariki7 and spiritual leaders, the Auctoritas began rudimentary initial containment. Containment in this period was characterized by repeated destruction of RPC-141 in an attempt to keep the mass of the entity too low to successfully enter an active state. While the triggers for the entity’s active state were known at the time, this containment approach was deemed the most appropriate. The widely publicized events of 1862, wherein Peruvian slave raiders captured or killed over half the native population of the island,8 were known of well in advance by embedded Auctoritas agents, however, containment procedures were deemed enough to prevent an active event. The entity grew significantly in size, reaching 35m, following this event and managed to breach containment in an event that leads to ██ Auctoritas casualties. Heavy artillery was deployed which proved effective in decreasing the mass of RPC-141 enough to return it to a dormant state. The surviving Peruvian slavers and their native cargo were successfully amnestied and returned to their intended route. Containment procedures remained sustainable for the centuries following, assisted by the dwindling Rapa Nui population decreasing the frequency of active events until both time and budget constraints necessitated the hiring of Authority9 staff for OL-Site-42 from the native Rapa Nui. A novel solution presented itself in containing the entity without requiring constant destruction, through the use of Rapa Nui people as physical barriers RPC-141 could not bypass.10 This novel containment method gradually evolved into the current form, coinciding with greater autonomy of OL-Site-42 staff to manage containment of RPC-141. We can’t just slap high clearance on this and sweep it under the rug. We've done a lot of terrible things- necessary terrible things- but this? This didn’t further humanity at all, this was just being complicit. You know, I looked more into this. Do you know how many of those people we purchased to use as CSD-class afterwards? Too many. Too many to pretend we didn’t have anything to do with this. The descendants of these people are part of us, there's more than a few that've gone on from that island to do great things within our organisation, we can't just pretend we didn't let their ancestors be decimated and then hope they all died out on their own just so things would be easier for us. I’m pushing through immediate declassification of this information and… some form of reparations for the people of Rapa Nui. The details will have be hashed out later, we’ve tried to keep this a secret for way too long to let any more time be wasted. Classification changes reverted on majority order from The Board. Amnestics have been applied to the few staff who accessed the file while it was vandalised. Disciplinary actions for █████ ████████ are pending. Addendum-01: Due to the protective behavior of RPC-141, and the nature of the Authority staff utilized on Rapa Nui, reclassification of OL-Site-42 to full site status and the storage of Beta-class entities is currently under consideration by The Board. Reclassification of RPC-141 to Theta is suggested. Addendum-02: On █/█/1968 RPC-141 entered an active state, despite no observable triggers being detected. The entity stood up and began pointing directly out to a singular point in space. Since this date, the entity has not moved from this position or returned to its dormant state. 1. Colloquially called “Easter Island”. 2. The self-determined name for the native people of Rapa Nui. 3. Defined as an active event likely to cause harm, such as a landslide above a village, a violent act being taken against a human being, or a non-native individual engaging in wide-spread land clearing. 4. There appears to be a direct hierarchy at play, wherein RPC-141 is more lenient to actions harming cultural heritage or geographical location, or even totally acceptant of those actions when they are committed by a person of Rapa Nui descent. 5. Wherein RPC-141 evacuated people of Rapa Nui descent from the path of the storm. 6. The precursor organization to the modern Authority that was active at the time. 7. Native title analogous to a king. 8. Understood to have been around 1500 men, women, and children. 9. As by this time reformation into the modern Authority had occurred.